...Continued from Part II. On our second day with the phone conversation, David Wilson, author of the bestseller Bicycling Science, told me about his love for human powered vehicles, the bikes he rides, his belief in pedal power for everyday tasks, and why he thinks cycling has had a challenge gaining popularity in the U.S. Enjoy. And...no charge. Q. Tell me what got you into cycling? DGW : Well...when I was four or five in Britain in the early 1930s, the life goal of all young boys was to be "engine drivers", and I was no exception [engine = rail, locomotive]. Trains were still romantic. A little later I transferred my ambition to that of being a pilot. A more immediate goal was to ride a bicycle. 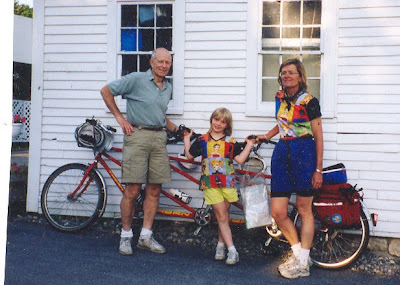 My parents were adamant that I would not be allowed to ride a bicycle until I was nine, and promised that I would get one then. I was not a rebellious kid, and accepted this restriction with good grace, while being envious of my friends who were given bikes much earlier. My desire did, however, rise to a fever pitch. As my ninth birthday approached, I began reminding my parents of their promise. Dad went down to the coal cellar and brought up an ancient "Hercules" single-speed boy's bicycle, grossly dirty and as heavy as sin. Most child psychologists would aver that it could not possibly excite any emotion other than repulsion. However, I was thrilled to bits. I rode everywhere I could, especially to Sutton Park, the two-thousand-plus-acre stretch of grassland, woods and lakes that distinguished our town. My friends and I loved to crawl through tunnels in the gorse bushes and swim in the lakes and climb trees. Later that year I started in the junior school of Bishop Vesey's Grammar School, a venerable institution founded in 1527 for poor children, but in my time firmly middle class in clientele and high class in education. I would bike the 2.5 miles there after breakfast for the start of school at 8:15am, leave for lunch at 11:45am to bike home, bike back for classes at 2pm, and then home at 4:15pm. I looked forward to each trip on a bicycle. I still do. Q. And the bike after that? DGW : By today's standards, it maybe called a 'clunker' you know...wasn't very flashy, but it had a three-speed gear, 26-inch wheels, and handlebars that could be reversed to the semi-dropped position. Having done really well in academics in senior school, I was placed into an advanced stream called 3A, and the competition for me from other students became stronger. However, I was in danger of losing out because I was so enraptured during classes at the thought of my beautiful bike shedding down the hill. And improvements kept suggesting themselves. My first purchase was of beautiful Lauterwasser handlebars. Later I wanted a Cyclo derailleur three-speed gear. The Cyclo company was the principal manufacturer of derailleur gears in France, and its UK branch was in Birmingham. I was learning the value of money and of trade, but I bought my gear. My friends said that I was unnecessarily ostentatious when changing gears near them and especially when near young women. Derailleurs were not very common at that time. Q. Sounds like you were very happy then with the machine. How long did you ride it? DGW : For rest of my life in Britain, almost a quarter-century. Q. Very impressive. (coming to think of it..that does not even equal my total age). Were you technically inclined with your bike then? DGW : I bought my own gear and would try and work with it myself. I remember those long rides in wartime, in the early months of the Second World War...where prior to the rides, I would be well prepared in advance. I would take my bike apart to that last ball bearing and put it together again lovingly with grease and oil. I would even get my hands on nearly every book that covered bicycle servicing and touring. I loved doing things with the bike, tinkering with it... In fact, I loved fixing things from a young age, not just the bicycle. Q. Is that what interested you in engineering later on...or...? DGW : It did play a role, yes. After graduation from Bishop Vessey's, I presented myself for induction into the Royal Navy. However, the end of the war in Europe took place in May 1945, and the end of the Pacific war seemed close, and at the recruitment offices I and my class buddies were informed that we were not wanted in the armed services at that time of demobilization. There was some sort of encouragement to go into engineering, which I had intended to do in any case, and to offer ourselves for military service subsequently. Q. What bikes did you ride here, and how many do you own? DGW : Mostly recumbents. Let's see... I have 1...2....3......4....about..5 recumbents including a recumbent tandem, and 2 mountain bikes. Then there are 5 other bikes between my wife and daughter. So about 12 bikes in total for the family. Q. Oh! Is your wife an enthusiast as well? DGW : Oh yes. Ellen happens to be an avid cyclist. Infact, one of the reasons I chose to get together with her was because of our similar interests. Q. Can you remember a very memorable ride, that perhaps still sticks in your head? DGW : Hmm...there are many. One notable ride I attempted was a 160 miler on a recumbent from Massachusetts to group up with some friends of mine for a hiking trip in NH. Pinkham Notch. It was an 8 day hiking trip, and I remember having a lot of luggage on the bike. The roads at that time weren't too good either, and this was back in 1986. So I was pulling a lot of weight with me that day. Later on the hiking trip was were I met my would-be wife, Ellen. Q. Sounds like that tiring effort paid off in a suitable life partner! 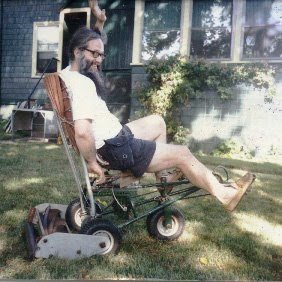 ...Since we're in the topic of pedal powered, I have read that you even use or own a pedal powered lawn mower. Is that true? DGW : Well yes. It was something I and a student of mine at MIT designed. His name was Micheal Shakespear. Considering the amount of budget we had, it was beautifully designed and executed. It gave it some airtime on some popular TV shows. Q. Most interesting. It seems you are a proponent of pedaling to help power daily chores. What are your thoughts on that? DGW : I think that the historical use of human muscle power was not only crude, but it was always short of the optimum. We find time and again that people were called upon to produce maximum power output, for instance in pumping or lifting water from a well or ditch, using only their arm and back muscles. No one thought of extending this work to the leg muscles. These tasks were also mostly of the slow, heaving variety, so that our unfortunate forebears had to cope with heat stress on top of the use of usually inappropriate muscles moving against resistances which were too large at speeds which were too low. In fact, doing this kind of work makes you feel not too superior compared to your ancient ancestors. People are still required to heave and shove with all their might, gaining an occasional inch or two. In some tasks, leg muscles are the most appropriate for the task. I have written in detail about the history of muscle use in the first chapter of Pedal Power. There, I also review machines that did well using leg power to get things done. Even pedal powered riding mowers. DGW : ...My co-author and I talked about that in Bicycling Science. The energy required to pedal a machine across soft ground is so high that the only way pedaling becomes superior to pushing a mower would be for the pedaler to be either stationary or moving slowly, while the cutter, presumably light in weight, covered a considerable area. Q. So it has to run slow and cover a large area to make sense, efficiency wise. Q. Your daily transport. Do you commute to work by bike? DGW : Oh yes. I rode my semi-recumbent. My commute to MIT was 8 miles one way. So about 16 miles of round trip each day. To Wilson Turbopower, it was 5 1/2 miles one way. Q. You say that in past-tense. Are you still riding these days? DGW : No, I've taken a break. I've had some health problems and had to get replacements done for both knees. After a certain age, your body starts to say no to the things you always enjoyed doing. It doesn't please me. Correction from David Gordon Wilson May 2, 2009 : What I meant here was that I’ve taken a break from riding my recumbent. I’m riding a semi-recumbent (the Rans Dynamik Trail.) I bought it when our daughter Susan, then eleven, left me on our hill (it’s 23% in places) on her new bike when I was on my old heavy recumbent. I found that I could still beat her up the hill on the Rans. I’m building a new recumbent at home. I “finished” it last year, but most of the brilliant ideas I had for improving it didn’t work, so I have to do some re-work. And my new left knee is becoming much stronger. Q. I'm sorry to hear that and I hope your knees feels better. While we're at the topic of transportation, why do you think people don't ride bicycles here more? Its a definite problem in the U.S. Everyone needs their cars to go 1 or 2 miles. Its ridiculous. Even walking has taken a second page to motorship. DGW : That's a definite problem here simply because vehicles are heavily subsidized in a variety of ways in the U.S. That's where some the gas tax goes. In this kind of environment, there is huge incentive to drive and cyclists are a minority. If you're among the minority, you must be pretty determined to be one. Gas taxes combined with fuel inefficient cars also aren't helping Americans. Even the legal attitude around bicycling is not quite good. I remember back in Britain, while a member of the Cycling Touring Club or the CTC, we had our own legal group to whom we could lodge complaints and issues should any of us have an incident with a motorist. You just don't find that here very often. Shakespear's thesis can be ordered from Document Services of the MIT Libraries. Bicycling Science also covers the technical aspects of the design. Thank you so much for this good read on this great mind! Can't wait for more! I wish I can get my hands on that pedal powered lawn mower thingy. Reading this brings up the important point that pedal power is not only used for transportation. It can be used for many other uses around the house. It puzzles me that people who support riding bicycles don't explore pedal powered replacement opportunities within their households. Not many people do that. One of the good books that talk about how laymen can do this is called The Human Powered Home : Choosing Muscles Over Motors by Tamara Dean. Wake up, America! Thanks so much Ron for this fine interview. I totally enjoyed it and look forward to more. I have just recently started biking, and have collected many books on the topic. I have heard from many places that Bicycling Science is like a bible of cycling books. I never bothered to get a copy for myself, because I didn't know if I'd be interested in the subject matter (too technical?). However, after reading your posts about the author...I'll say I'll make an effort! Chris : I just looked up that book, and indeed, it looks pretty cool. Its not the first book on the topic but it might have information that others dont? ChicagoBIKENOOB : What a name you have there! You're not the only ChicagoBIKENOOB, are you? Yeah, you never know what'd interest you unless you read it. Although there's a lot of physics and equations in Bicycling Science, its only food for thought. Infact, if you asked me recommend you one good book for cycling, it would be this. Reading some of the truths in the book could save you a lot of money over the long run. Trust me. Master Mechanic Calvin from Park Tools did a review of "Cycling....The Book" circa 1972. A correction has been added to one of the interview replies. Clarification from DGW is that he is still riding, and has not totally stopped. He prefers his semi-recumbent to his recumbent due to knee problems. These interviews are very entertaining. I have read some books and talked with people who were riding in the UK in the 1950s-1960s. The place was kind of an outpost of continental cycling, with road races banned and "secret" time trials. Great stuff--keep it going!